This book is full of mystery, action, and adventure. It is a tale of four dogs that want to help brighten people’s lives by uniting, restoring and bringing back relationships and history. This book is written very well, and is good for all ages. Rebecca Witten, Athens Christian Preparatory Academy 8th grade advanced English. “The Spaniel Family’s Time Capsule Mystery” is an excellent story about a family of dogs who go on an adventure. Throughout the adventure they encounter a buried time capsule, a friendly prairie dog, and a mysterious yet heart-warming story of a young girl, Verbena. Verbena’s story is set back in a monumental time in American history – World War II. Verbena grows up during the war and is forced to move away from her home, but before leaving she leaves her most prized possessions in a time capsule. When the Spaniel family finds the time capsule they try to locate Verbena and connect her with her past. With the help of their new friend Paintbrush, the prairie dog, the groups of friends helps Verbena relive her past. This story is beautifully crafted together and the author chooses a very memorable setting that is close to the heart of many Americans. It is a remarkable story that is tied together with an important historic event and, as a result, is a superb book. Gracie Millar, Athens Christian Preparatory Academy 8th grade advanced English. “The Spaniel Family’s Time Capsule Mystery” is a wonderful book about the Spaniel Family and how they find a box in their backyard. One day, Daisy was digging in the Spaniel’s backyard, when she found a red box. It was filled with treasures from the past. While they were looking at the treasures, they saw a small eye looking through a hole in the fence. It was a prairie dog named Paintbrush! He helped them find out who the treasure belonged to. This is a great book for anyone to read! This book is about a family of spaniels who meet an unlikely friend. They need to figure out the story behind this mysterious time capsule. I remember reading her books as a kid. This book is a great all around mystery. I think most kids, who love animals, will love this book. Gavin Hardin, Athens Christian Preparatory Academy 8th grade advanced English. "The Spaniel Family's Thanksgiving" is the fourth title in a popular, award winning series about the Spaniel Family. Colorfully illustrated with a light pastel rainbow of expressive illustrations, "The Spaniel Family's Thanksgiving" follows the three spaniels through many Thanksgiving preparations, including shopping at the pet food store and farmers’ market, food gathering for a variety of hungry animals, and finally careful preparations for an outdoor feast that begins with singing new lyrics to an old Thanksgiving song, "Over the River and Through the Woods." An amazing assortment of creatures are invited to participate in the Spaniel Family's Thanksgiving, including a mockingbird, a skunk, a mama rabbit and her children, a raccoon, an iguana, and even an orange cat. Each animal is asked to express what they are thankful for, and each one has exactly the right food to eat. Even a lost puppy is invited to the feast for no one should be hungry at Thanksgiving! At the end of the book, there is further information about the celebration of Thanksgiving as an American holiday, along with a partial quotation of the poem "A Boy’s Thanksgiving Day," which was adapted for "The Spaniel Family’s Thanksgiving." Children age 5 and up will enjoy reading "The Spaniel Family's Thanksgiving" with some help, and they will learn more about the meaning of the holiday. A portion of the proceeds from "The Spaniel Family's Thanksgiving" will be donated to food programs for children. 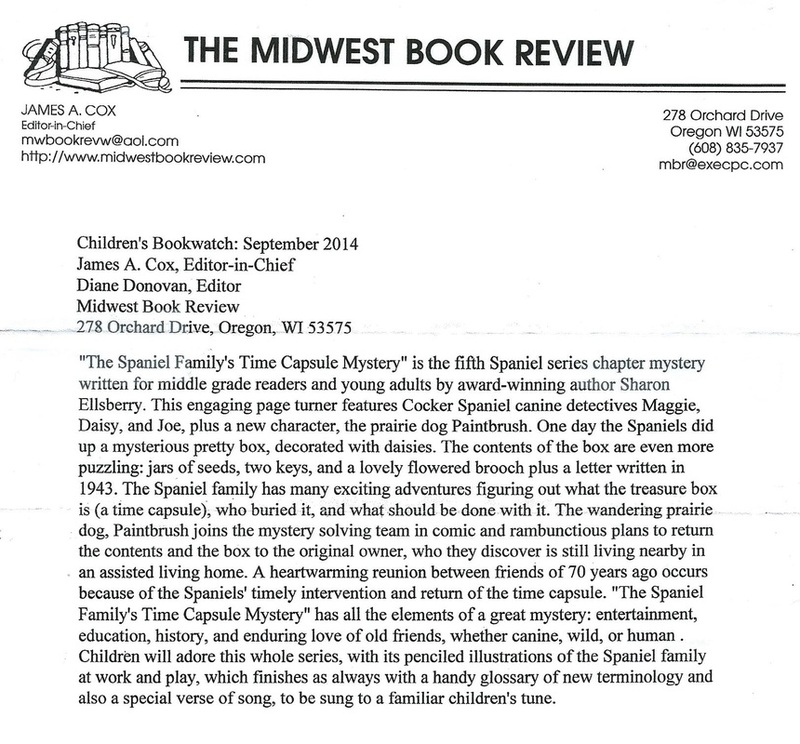 This review has been provided to the Helen C. White Library's "Cooperative Children's Book Center" (University of Wisconsin, Madison) where it will be made available to school and community librarians throughout Wisconsin's public school systems and libraries. This review has also been provided to the Cengage Learning, Gale interactive CD-ROM series "Book Review Index" which is published four times yearly for academic, corporate, and public library systems. This is a charming story book about a family of Cocker Spaniels as they prepare to have Thanksgiving dinner with their friends. Maggie, Joe and Daisy are from the Cocker Spaniel breed of dogs, each with a different colored coat. The trio goes shopping for food for their many different friends such as a skunk, a variety of birds, a cat, the rabbit family, a raccoon and even an Iguana. The menu is set for all to enjoy the feast. Also included in “The Spaniel Family’s Thanksgiving” book are interesting facts about the famous song, “Over the River and Through the Woods”, in addition to the history of how Thanksgiving became a national holiday. This colorfully illustrated book will be enjoyed for generations. We are proud to award this book the Dove “Family Approved” Seal for all ages. Maggie, Joe, and Daisy are up to their usual antics. This time they are set on celebrating Thanksgiving with their friends. Not just their doggy friends, but others as well. The adventure begins with a trip out the loose board in the back yard to the grocery store and proceeds from there. See if you can recognize who will like what food. It is a book which teaches us all, adults and children alike the importance of being thankful for what we have and what we can share. As a plus, Sharon has added a history lesson at the back of the book about the origins of Thanksgiving. Her books are always geared to teach as well as entertain. Thanks Sharon for another fun adventure with the Go Spaniel family. In this latest book, Maggie, Joe, and Daisy invite a variety of animal friends to help them celebrate the season and find reasons to be thankful. One of the subtle messages in this book is inclusiveness. The animals that come to share the meal include a cat, a bird, rabbits, a skunk, and an iguana, all creatures who normally feed on each other. Instead, they sit at a table and eat the food that the dogs have gathered from the pet store and the farmer's market and the park, where they got nuts and tree bark. Ellsberry has created each of her stories around what she calls a "Character Development Value," and The Spaniel Family's Thanksgiving highlights the fact that "every day is a thankful day when you can share a meal." Parents can use those values to start a conversation with their child about the message that each book puts forth, or the story can just be read for the fun of finding out what the Spaniel Family is up to. Ellsberry knows dog behavior and captures that so well in her prose. "A dog's home is it's dog castle. "The Mystery of the Spaniel Family's Dog House" tells the story of the Spaniel family, a family of dogs who are curious about the events of their doghouse. With the help of their friends they investigate what hides deeper in this story of a man's best friend, making "The Mystery of the Spaniel Family's Dog House" a collection any dog lover will relish." "Kids looking for a mystery will love Sharon Ellsberry’s latest Spaniel Family book, The Mystery of the Spaniel Family’s Dog House. You won’t need to have read the first two books to jump into this one, but readers who have enjoyed the previous two picture books, The Spaniel Family Goes to the State Fair and The Spaniel Family’s Pen Pal Adventure will be pleased to see that this book is a chapter book, perfect for growing reading skills. When the Spaniel family moves to East Texas they fear that their dog house is haunted. Strange noises come from the house, causing them to recruit the services of Jaba the Mutt, a bulldog ghost hunter. With humor and common sense, the mystery is solved, but another mystery unfolds. There’s just the right amount of spooky fun to keep kids reading, and the large font and short chapters are perfect for young readers. This is another great Texas tale from Texas author Sharon Ellsberry! " "This is a clever, well-written story with an engaging mystery and a surprising, yet pleasing resolution. A great deal of attention has been paid to making the prose lyrical and appealing to young readers – and older readers. Kids of all ages will absolutely love Jaba the Mutt, and the similarity with the Star Wars character is unmistakable. The pencil illustrations by Amy Fox are detailed and delightful, pulling the reader deeper into the story and bringing it to life. The Spaniel Family books are noted for the engaging characters, delightful prose, as well as poems and songs that young readers can enjoy. Even though the books are geared toward readers age 5-10, they are also the kind of books that parents and grandparents can enjoy reading to young people."